The 'Liberator' is a physible, 3D-printable single shot handgun, the first such printable firearm design made widely available online. In 2012, the U.S.-based group Defense Distributed disclosed plans to design a working plastic gun that could be downloaded and reproduced by anybody with a 3D printer. Defense Distributed has also designed a 3D printable AR-15 type rifle lower receiver (capable of lasting more than 650 rounds) and a variety of magazines, including for the AK-47. In May 2013, Defense Distributed completed design of the first working blueprint to produce a plastic gun with a 3D printer. The United States Department of State demanded removal of the instructions from the Defense Distributed website, deeming them a violation of the Arms Export Control Act. In 2015, Defense Distributed founder Cody Wilson sued the United States government on free speech grounds and in 2018 the Department of Justice settled, acknowledging Wilson's right to publish instructions for the production of 3D printed firearms. In 2013 a Texas company, Solid Concepts, demonstrated a 3D printed version of an M1911 pistol made of metal, using an industrial 3D printer. The U.S. Department of Homeland Security and the Joint Regional Intelligence Center released a memo stating "Significant advances in three-dimensional (3D) printing capabilities, availability of free digital 3D printer files for firearms components, and difficulty regulating file sharing may present public safety risks from unqualified gun seekers who obtain or manufacture 3D printed guns," and that "proposed legislation to ban 3D printing of weapons may deter, but cannot completely prevent their production. Even if the practice is prohibited by new legislation, online distribution of these digital files will be as difficult to control as any other illegally traded music, movie or software files." Attempting to restrict the distribution over the Internet of gun plans has been likened to the futility of preventing the widespread distribution of DeCSS which enabled DVD ripping. After the US government had Defense Distributed take down the plans, they were still widely available via The Pirate Bay and other file sharing sites. Some US legislators have proposed regulations on 3D printers to prevent their use for printing guns. 3D printing advocates have suggested that such regulations would be futile, could cripple the 3D printing industry, and could infringe on free speech rights. In Australia, the state law of New South Wales criminalizes the possession of the digital plans and files to 3D print firearms under Section 51F of the Firearms Act 1996. In one case in 2015, a loaded 3D printed firearm was found during a police raid on a meth lab. In another case in February 2017, Sicen Sun was arrested on charges related to 3D printable guns. During trial in December 2017 he pleaded guilty to charges including possessing a digital blueprint for the manufacture of firearms, manufacturing a pistol without a licence permit, and possessing an unauthorised pistol. In sentence hearing on August 6, 2018, he told the court he initially wanted to replicate a gun from the videogame Halo and when he started searching blueprints online he downloaded plans for other guns which looked "cool." Sun had previously posted an advertisement to the internet to sell one of his imitation weapons for "$1 million negotiable" on a Facebook buy, swap and sell group, which set off the investigation. In the United Kingdom, the Firearms Act 1968 bans the manufacturing of guns and gun parts without government approval. Hence, 3D printed weapons are de facto banned because the law bans all manufacturing, regardless of method. However, the Home Office updated its Guide on Firearms Licensing Law to specifically mention the ban on 3D printed weapons. In 2013, a police raid on a Manchester gang resulted in seizures in what are believed to be 3D printed gun parts. The Greater Manchester police believe they found a trigger and a magazine along with a quantity of gunpowder. Under the Undetectable Firearms Act any firearm that cannot be detected by a metal detector is illegal to manufacture, so legal designs for firearms such as the Liberator require a metal plate to be inserted into the printed body. The act had a sunset provision to expire December 9, 2013. Senator Charles Schumer proposed renewing the law, and expanding the type of guns that would be prohibited. Proposed renewals and expansions of the current Undetectable Firearms Act (H.R. 1474, S. 1149) include provisions to criminalize individual production of firearm receivers and magazines that do not include arbitrary amounts of metal, measures outside the scope of the original UFA and not extended to cover commercial manufacture. On December 3, 2013, the United States House of Representatives passed the bill To extend the Undetectable Firearms Act of 1988 for 10 years (H.R. 3626; 113th Congress). The bill extended the Act, but did not change any of the law's provisions. On August 27, 2018, a United States federal judge blocked the Defense Distributed and its founder, Cody Wilson, from posting 3D-printed gun blueprints online. Judge Lasnik first imposed a temporary restraining order on Wilson, but that was due to expire, so he mandated a preliminary injunction that blocks online distribution in the United States while the legal proceedings are ongoing. In Japan, in May 2014, Yoshitomo Imura was the first person to be arrested for possessing printed guns. Imura had five guns, two of which were capable of being fired, but had no ammunition. Imura had previously posted blueprints and video of his guns to the Internet, which set off the investigation. ^ Greenberg, Andy (August 23, 2012). 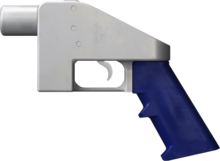 "'Wiki Weapon Project' Aims To Create A Gun Anyone Can 3D-Print At Home". Forbes. Retrieved August 27, 2012. ^ Poeter, Damon (August 24, 2012). "Could a 'Printable Gun' Change the World?". PC Magazine. Retrieved August 27, 2012. ^ Farivar, Cyrus (March 1, 2013). ""Download this gun": 3D-printed semi-automatic fires over 600 rounds". Ars Technica. Retrieved February 5, 2015. ^ "Blueprints for 3-D printer gun pulled off website". www.statesman.com. Retrieved November 10, 2013. ^ "Defense Distributed v. United States Department of State". harvardlawreview.org. Retrieved October 1, 2017. ^ Kopel, David (July 10, 2018). "US government drops prohibition on files for 3D printed arms". Reason.com. Archived from the original on July 13, 2018. Retrieved July 13, 2018. ^ Greenberg, Andy (July 10, 2018). "A Landmark Legal Shift Opens Pandora's Box for DIY Guns". Wired.com. Archived from the original on July 10, 2018. Retrieved July 13, 2018. ^ Gross, Doug (November 9, 2013). "Texas company makes metal gun with 3-D printer". CNN. Retrieved November 9, 2013. ^ "3D Printers, Meet Othermill: A CNC machine for your home office (VIDEO)". Guns.com. Retrieved November 10, 2013. ^ Clark (October 6, 2011). "The Third Wave, CNC, Stereolithography, and the end of gun control". PopeHat.com. ^ Rosenwald, Michael S. (February 25, 2013). "Weapons made with 3-D printers could test gun-control efforts". Washington Post. ^ "Making guns at home: Ready, print, fire". The Economist. February 16, 2013. Retrieved November 10, 2013. ^ Rayner, Alex (May 6, 2013). "3D-printable guns are just the start, says Cody Wilson". The Guardian. London. ^ Manjoo, Farhad (May 8, 2013). "3-D-printed gun: Yes, it will be possible to make weapons with 3-D printers. No, that doesn't make gun control futile". Slate.com. Retrieved November 10, 2013. ^ "Homeland Security bulletin warns 3D-printed guns may be 'impossible' to stop". Fox News. May 23, 2013. Retrieved November 10, 2013. ^ Cochrane, Peter (May 21, 2013). "Peter Cochrane's Blog: Beyond 3D Printed Guns". TechRepublic. Retrieved November 10, 2013. ^ Gilani, Nadia (May 6, 2013). "Gun factory fears as 3D blueprints put online by Defense Distributed | Metro News". Metro.co.uk. Retrieved November 10, 2013. ^ "Liberator: First 3D-printed gun sparks gun control controversy". Digitaljournal.com. Retrieved November 10, 2013. ^ "First 3D Printed Gun 'The Liberator' Successfully Fired - IBTimes UK". Ibtimes.co.uk. May 7, 2013. Archived from the original on October 29, 2013. Retrieved November 10, 2013. ^ "US demands removal of 3D printed gun blueprints". neurope.eu. Retrieved November 10, 2013. ^ "España y EE.UU. lideran las descargas de los planos de la pistola de impresión casera | Economía | EL PAÍS". Economia.elpais.com. May 9, 2013. Retrieved November 10, 2013. ^ "Controlled by Guns". Quiet Babylon. May 7, 2013. Retrieved November 10, 2013. ^ "3dprinting | Jon Camfield dot com". Joncamfield.com. Retrieved November 10, 2013. ^ "State Dept Censors 3D Gun Plans, Citing 'National Security' - News from Antiwar.com". News.antiwar.com. May 10, 2013. Retrieved November 10, 2013. ^ "Wishful Thinking Is Control Freaks' Last Defense Against 3D-Printed Guns - Hit & Run". Reason.com. May 8, 2013. Retrieved November 10, 2013. ^ "The Pirate Bay steps in to distribute 3-D gun designs". Salon.com. May 10, 2013. Retrieved November 10, 2013. ^ "Sen. Leland Yee Proposes Regulating Guns From 3-D Printers « CBS Sacramento". Sacramento.cbslocal.com. May 8, 2013. Retrieved November 10, 2013. ^ "Schumer Announces Support For Measure To Make 3D Printed Guns Illegal « CBS New York". Newyork.cbslocal.com. May 5, 2013. Retrieved November 10, 2013. ^ Ball, James (May 10, 2013). "US government attempts to stifle 3D-printer gun designs will ultimately fail". The Guardian. London. ^ "Like It Or Not, 3D Printing Will Probably Be Legislated". TechCrunch. January 18, 2013. Retrieved November 10, 2013. ^ Beckhusen, Robert (February 15, 2013). "3-D Printing Pioneer Wants Government to Restrict Gunpowder, Not Printable Guns | Danger Room". Wired.com. Retrieved November 10, 2013. ^ "How Defense Distributed Already Upended the World - Philip Bump". The Atlantic Wire. May 10, 2013. Retrieved November 10, 2013. ^ Putrich, Gayle S. (May 13, 2013). "Plastic gun draws eyes to 3-D printing". European Plastics News. ^ New South Wales Legislation. "Section 51F of Firearms Act 1996 (NSW)". New South Wales legislation. Retrieved March 10, 2017. ^ "Mudgeeraba acreage raided, 3D-printed gun and drug lab allegedly found". ABC News AU. Retrieved November 15, 2016. ^ UK Legislation. "Firearms Act 1968". UK Legislation. Retrieved November 15, 2016. ^ UK Home Office. "Guide on Firearms Licensing Law" (PDF). UK Government. UK Home Office. Retrieved November 15, 2016. ^ Press Association (October 25, 2013). "Suspected 3D-printed gun found in Manchester gang raid, say police". The Guardian. Retrieved November 15, 2016. ^ "Senator seeks to extend ban on 'undetectable' 3D-printed guns". the Guardian. Retrieved February 15, 2015. ^ "H.R. 3626 - All Actions". United States Congress. Retrieved December 5, 2013. ^ "House votes to renew ban on plastic firearms". Foxnews.com. December 3, 2013. Retrieved December 5, 2013. ^ Vanian, Jonathan (August 27, 2018). "3D-Printed Gun Blueprints Aren't Allowed Online, Federal Judge Rules". Fortune. Retrieved August 28, 2018. ^ "Japanese man arrested for possessing 3-D printer guns". Retrieved February 15, 2015. How 3-D Printed Guns Evolved Into Serious Weapons in Just One Year, Wired, May 2014. Should We Be Afraid of the 3D Printed Gun?, Popular Mechanics, May 2014.